Cover more of your floor than you ever thought possible and broaden your design horizons with our extensive selection of vinyl flooring in Bel Air, MD. 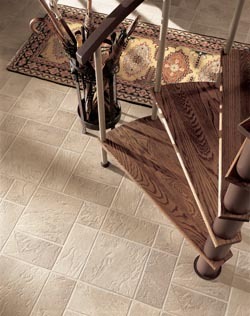 Top Notch Flooring America is dedicated to your success, so we support your goals with the design assistance you need. You will immediately notice the difference when you walk through the doors of our local flooring showroom. Start a conversation with a local flooring representative today. We take the time to ask you the important questions about your interior, your existing décor, and the people you share your home with. Each of your rooms is different in some way. While authentic hardwood is great for the dining room, it will react when exposed to the moisture and sunlight in your kitchen. Our design team takes these differences into account when we recommend flooring for each room. Tell us more about your existing floors, and let us identify a new product that fits your environment. Our showroom offers a number of products from the major manufacturers you have come to love. These vinyl planks and tiles feature a greater level of give underfoot for additional comfort, and the water resistance makes these floors a breeze to clean as well. Start improving the value of your home with flooring that fits your lifestyle. You deserve a floor that fits your way of life. Decorating a home with active kids and pets requires floors that are capable of withstanding scratches and spills on a daily basis. Remodeling rooms with greater levels of moisture may seem confusing when your flooring options are limited. Browse through our selection of vinyl tile flooring, and start transforming your kitchen into a destination for the entire family. Dedicate more to the flooring choices in the den and kitchen when you install vinyl sheet flooring throughout the other rooms in your home. The unbroken pattern is sure to get people to take notice, and the surface provides fewer places for dust and dirt to hide. When the time comes to replace the floors in the laundry room, vinyl plank flooring can give you the functionality you want and the character you desire. Protect the investment you have made in your flooring when you choose installation by our skilled professionals. With our 5-Star Selection System, you can choose floors that include the price protection guarantees and installation warranties you need. You get floors at a price you can count on, and you get the best fit possible in your home or business. Contact us today to start planning your kitchen renovation that includes vinyl flooring. We proudly serve customers in Bel Air, Fallston, Forest Hill, Abingdon, and Kingsville, Maryland, and surrounding communities.